Among all the white wine appellations in Italy, Soave is one of the most important. I had no idea until reading about the area. 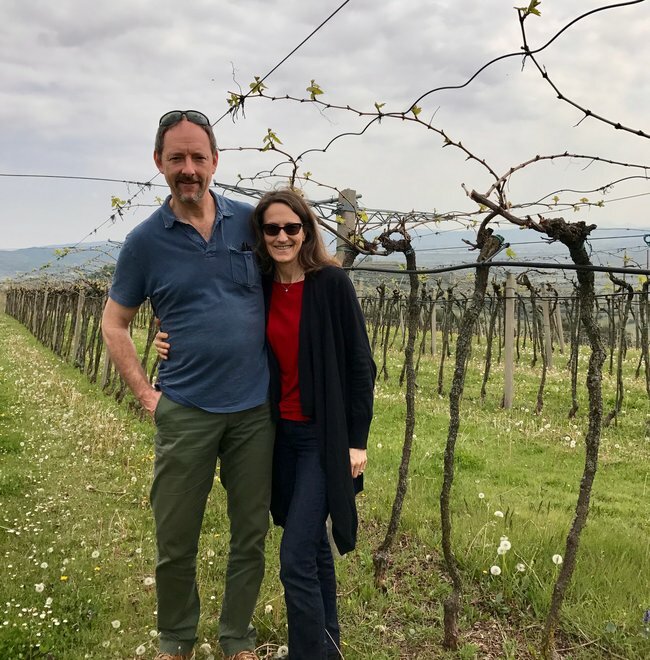 This prompted a trip to Verona and the Veneto last year where Mark and I spent two days learning about and tasting wine from the region, including the wines of Cantina del Castello. 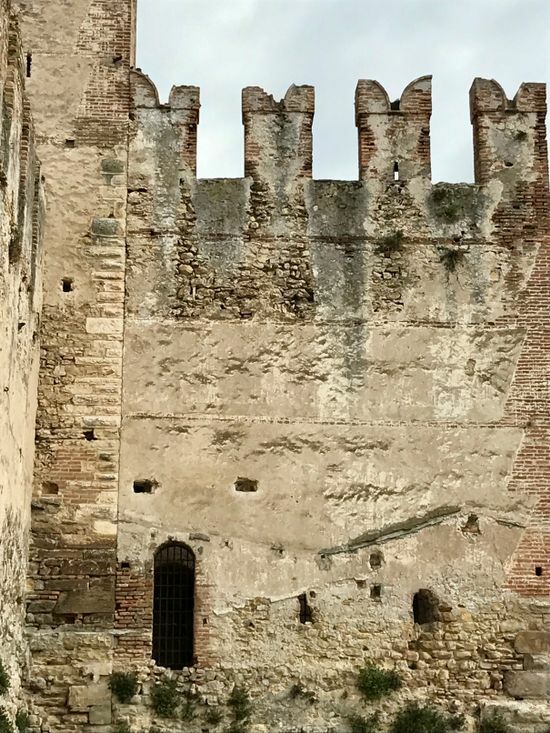 We were in Verona in 2016 for a different purpose and dug into Valoplicella wines. You can read about that here …includes a great place to eat in Verona! Soave has a story similar to a handful of Italian regions- successful early on then expansion to meet newfound demand. But production of larger quantities of plain wine resulted in a fall from popularity. This happened in Soave and unfortunately the name retained a negative connotation for years. 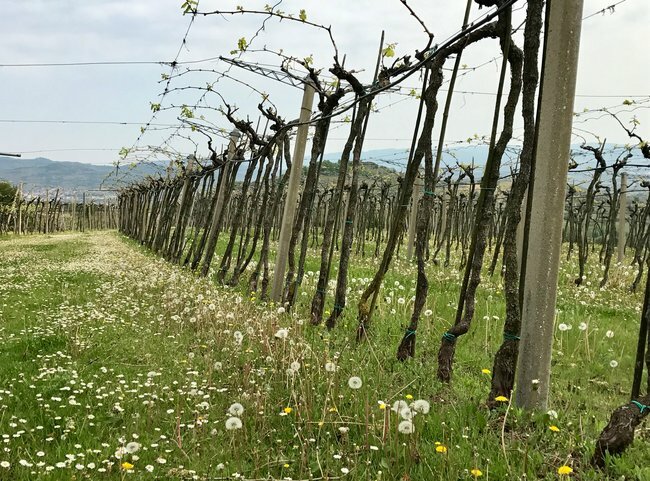 What you might not know is several producers including a great champion of Soave, Nino Pieropan pursued quality and single vineyard ‘cru’ sites to prove the Garganega grape was capable of great things. The region is now producing dynamic, expressive wines. We started one of our days at the Scaligeri Castle. Dating back to the 10th century, this fortress has a tumultuous history. Worth a visit! Strolling further through the town, we arrived at Cantina del Castello. It’s a family enterprise at Cantina del Castello. 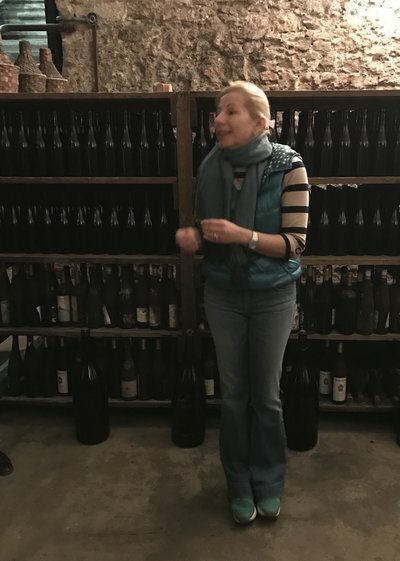 Proprietor Signora Stocchetti handed out glasses of their Classico Soave and took us into the cellar. Stocchetti explains the history of their winery and wines. A few library wines are hundreds of years old. We tasted three “cru” Soave wines: Classico, Carniga and Pressoni. Each showcased a different side of Garganega, the main grape in this white wine appellation. 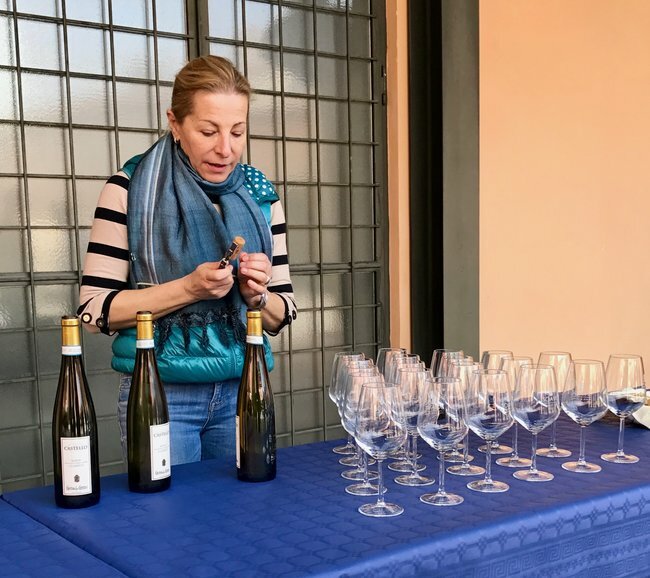 Wines must be a minimum of 70% Garganega with the remaining amount Trebbiano di Soave (aka Turbiana) and/or Chardonnay. Classico- Their traditional Soave smells of white flowers, peaches and honeydew melon. It has medium acidity and a round, mouth feel that lingers with mild crushed stone characteristics. Carniga- They call this version their “Extreme Soave”. The wine is aged in stainless tanks for several months. With aromas of white flowers and tropical fruits, it has both medium acidity and body, and saline hints on the finish. Pressoni is the Cantinas Elegant Soave. 80% Garganega 20% Trebbiano di Soave, it was fermented in stainless tanks where it remained for 3-months of aging on the lees. The wine had a surprising mineral character, again with floral notes, yellow peach, less ripe mango and hints of marjoram. 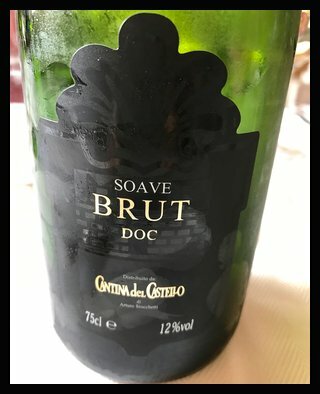 Soave DOC Classico Spumante Brut- We tasted this sparkling wine at lunch, a blend of 90% Garganega and 10% Trebbiano di Soave. Made via the Tank method, bright and refreshing. They also make Recioto (dessert wine), Valpolicella Superiore Ripasso, Amarone della Valpolicella, and Grappa. So off we went to discover the volcanic soils on which 13 hectares (32 acres) of Garganega and Turbiana vines are planted. The overhead Pergola Veronese trellising system is historically the prevalent system in Soave, although more are switching to Guyot. 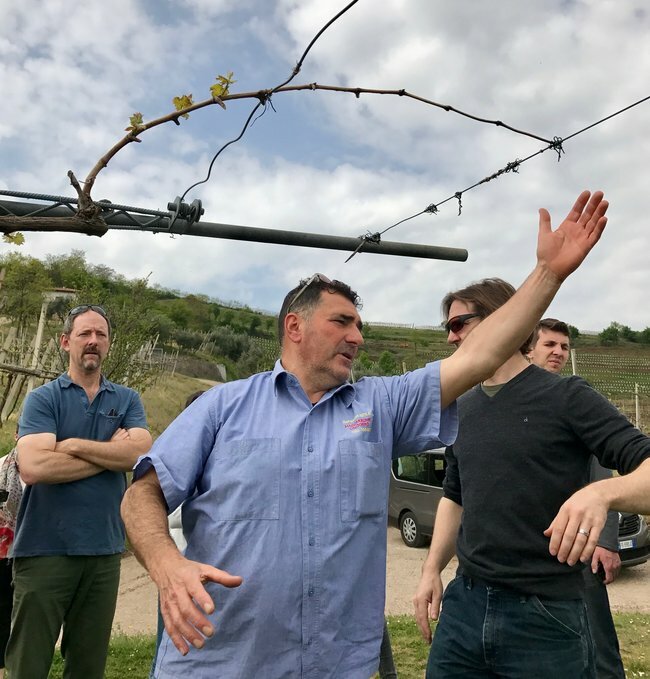 The vineyard manager educated us on the soils and all about the Pergola Veronese system. With this system, grapes can only be hand harvested. Here is a nice article about the Pergola versus Guyot for those who want to know more. 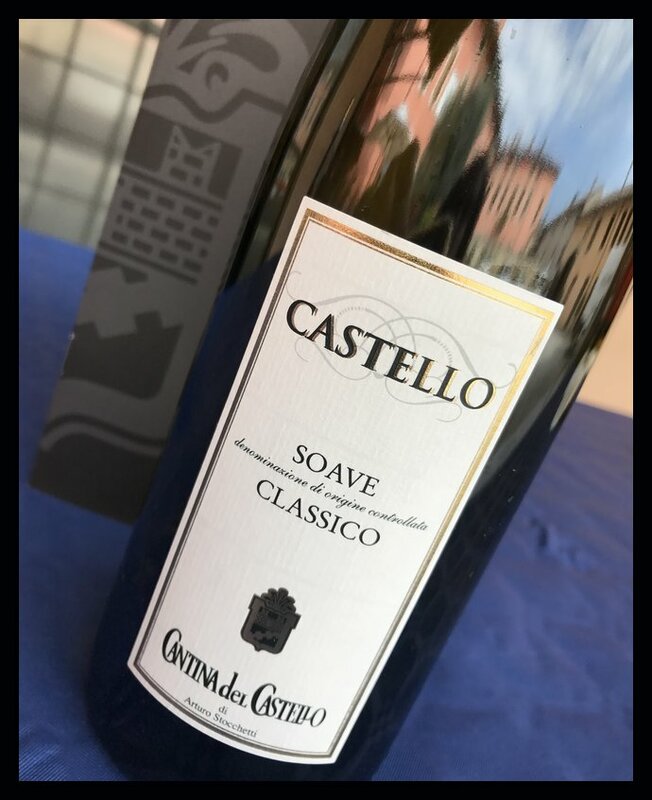 I was happy when Li from The Wining Hour chose Soave for our Italian Food, Wine, Travel (#ItalianFWT) June theme. Since I hadn’t written about our visit, this was a perfect excuse to share it with you! If you haven’t gone to Verona or the Veneto, we highly recommend the area. 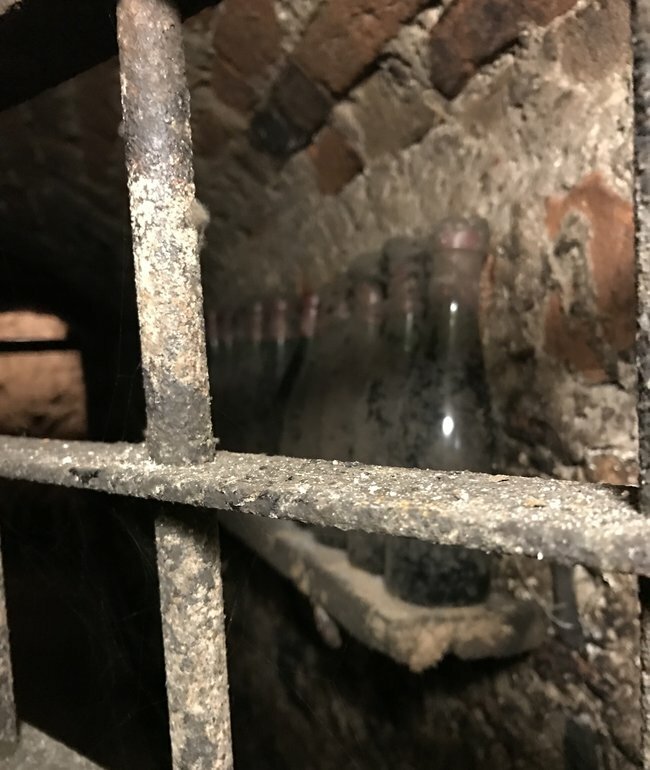 In the meantime, I hope these articles about Soave from the #ItalianFWT group will entice you. I’m glad I read this essay. I am better because of it! The back-story is so much fun to read, and learn. Glad you are teaching us.. but wish I was on your side doing it…. Many thanks John, perhaps you’ll make it to this side of the Atlantic at some point and do it! Castles and wine, and I assume good food too?!? I’ve ne et been to Italy but love many Italian white wines. Thanks for sharing info about Soave and Garganega. Off to check out some of the other groups articles too. Ah yes, amazing food Martha. The food is great most anywhere you go in Italy! We recently started carrying one of their wines at the store I work at–I think I’m going to have to pick it up to try! Also, we’re planning a trip to Italy this fall and hoping to go to Verona. Will have to get your tips! Looks like a great visit with some great pictures. I really enjoy the wines of this area so I’m glad there has been a turn on quality produced. I just wish more folks got to understand that. Oh yes, memorable visit. After Cantina del Castello we went to two other wineries for more Soave. Since that trip, I’m a Soave believer. Like you, hope more people realize they are making whites that can compete with the best of them! Verona! Did you see Romero and Juliet? We just saw OSF’s latest production—as usual, a delightful adaptation. I did see Romeo and Juliet. Was nearby thus couldn’t resist. OSF- their work is always a treat! Very detailed article on Soave from Cantina del Castello. I certainly look forward to trying their spumante one day. It was my Mark and my first sparkling Garganega. Hope you do get to taste it one day Li!